I said this in 2008 and I’ll say it again: Hispanics are a resourceful bunch and have crafted a brilliant master plan to take over the U.S: It’s quite simple, come to think about it: Reproduce quickly and in large quantities. In the latest installment of the Here’s How We Plan to Take Over the U.S. series, a Latino couple in Nebraska (Yes, I repeat, Nebraska) last week became the proud parents of quintuplets. Mara, Cristóbal, Ximena, Arleth and Roselyn -what else?- García came to this world in July as a five-fold bundle of joy. 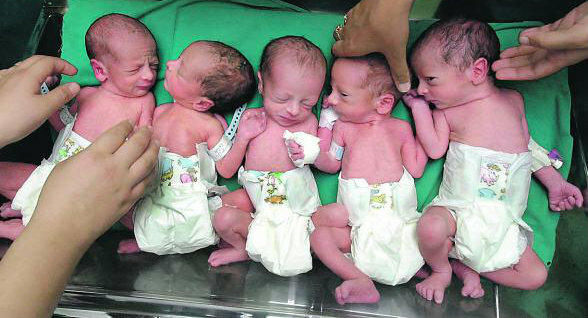 This entry was posted in Latin America, Mexico and tagged Hispanic population, Hispanics, Quintuplets. Bookmark the permalink.